However, I am even more impressed by Hamilton in Federalist 70. In his comparison of the unitary executive of the American presidency to the British Crown, he recommended that the United Kingdom adopt Responsible Government, which did eventually emerge there in the 1820s and 1830s. Hamilton even made his recommendation, or prediction, based on the correct rationale! In England, the King is a perpetual magistrate; and it is a maxim which has obtained for the sake of the public peace that he is unaccountable for his administration, and his person sacred. Nothing, therefore, can be wiser in that Kingdom, than to annex to the King a constitutional council, who may be responsible to the nation for the advice they give. Without this, there would be no responsibility whatever in the executive department – an idea inadmissible in a free government. As the venerable Sir John George Bourinot explained in the 19th century, Responsible Government means that Ministers of the Crown (the Prime Minister and Cabinet) take responsibility for all acts of the Crown, which include expenditures proposed to Parliament and all policies enacted through Orders-in-Council and through the prerogative powers that Ministers exercise collectively or individually. By extension, Ministers of the Crown must also command the confidence of the Commons in order to govern. The Commons expresses its confidence by passing supply; withholding supply therefore amounts to a loss of confidence, after which the Prime Minister must either resign or advise the Governor General to dissolve Parliament. Paul Benoit and Vernon Bogdanor have shown that Responsible Government originally emerged in order to preserve the infallibility and inviolability of the Sovereign and make it compatible with modern parliamentary government and the political independence of Cabinet, which would now govern not merely on the King’s whim, but based on whether it could command the confidence of the Commons. In the 20st century, this arrangement now also upholds the partisan neutrality of the Sovereign. In other words, the Sovereign can still do no wrong because he acts on and in accordance with the advice of his Ministers of the Crown, who take responsibility for all the acts of the Crown that the Sovereign promulgates. (Only under exceptional circumstances would the Sovereign reject ministerial advice). Hamilton demonstrated such prescience because he understood that any progress in the United Kingdom toward Responsible Government would necessarily have to incorporate and rein in royal infallibility. 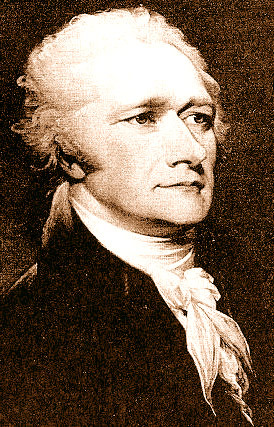 For all these reasons, I consider Alexander Hamilton one of the most significant theoreticians of executive power in the history of the English-speaking world and vastly under-appreciated compared to that over-rated political Romantic Thomas Jefferson. I also suspect that Hamilton would have preferred responsible parliamentary government to presidentialism, if the former had existed in the 1780s, because it accommodates “energy in the executive” while ensuring that the executive remains accountable to parliament and to the people. This entry was posted in Confidence Convention, History of British North America, Origins, Responsible Government and tagged Alexander Hamilton, Federalist Papers, Paul Benoit, royal infallibility, Sir John George Bourinot, Vernon Bogdanor. Bookmark the permalink.